Fernanda Chieco, O cachorro, o correio, o casal, o dorminhoco (The Dog, the Post Office, the Couple, the Sleeper), 2014, watercolor on paper, 67 5/8 × 97 7/8". 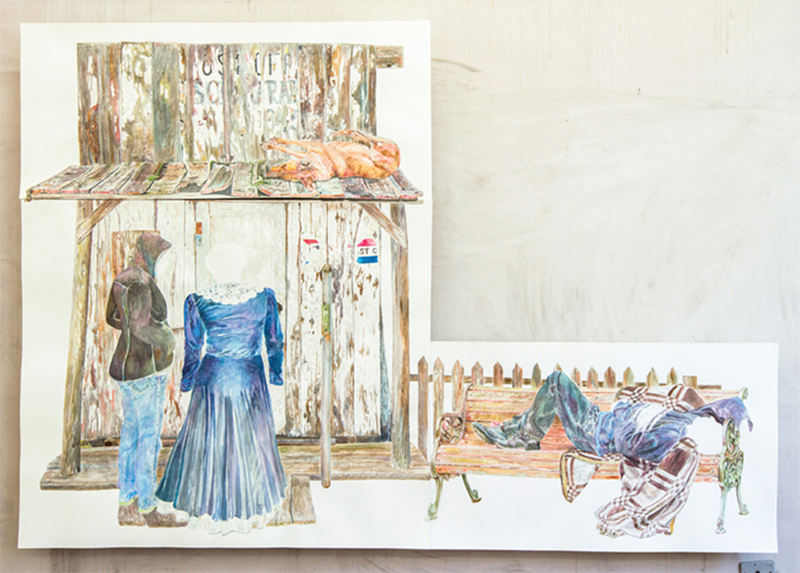 The six large watercolors in Fernanda Chieco’s recent exhibition “Gone” are figurative works on paper inspired by her visits to abandoned cities in the Colorado Desert. While she was on a residency in Fort Collins, Colorado, she discovered that in the state there are roughly 1,500 of these “ghost towns”settlements abandoned suddenly by their inhabitants, who left all their belongings behind just as they wereand she visited more than twenty of them.